Ria Loves Pawlish: OPI The "It" Color with OPI Crown Me Already! man, i can't believe it's time for my husband to go back to work! major bums because it was awesome having him around all the time :) went to Ulta today and made it out with only one new polish! quite an accomplishment, really! *fair warning* this post is one most people will associate with spring... it reminds me of daffodils. 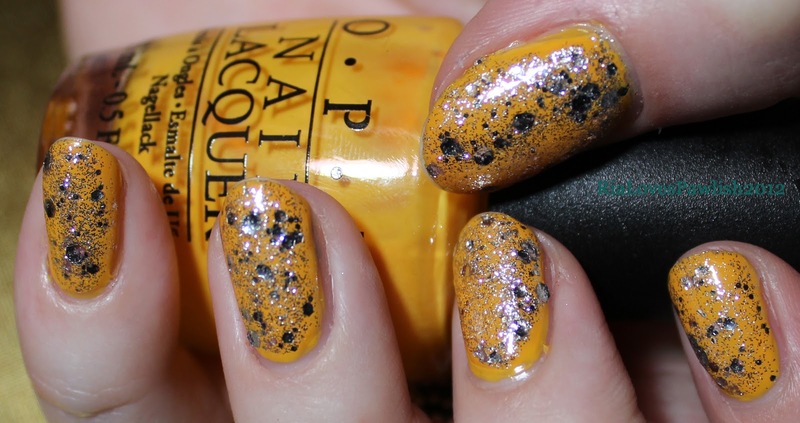 since i just grab for whatever looks good to me no matter what the season is, today we have OPI The "It" Color. really, the formula is a tragedy... like most yellows. nobody seems be able to make a yellow that isn't runny, patchy, and streaky. i used four coats and it still looked so awful i didn't even photograph on its own. i slapped on one coat of OPI Crown Me Already! from the 2011 Miss Universe collection. i LOVE the way CMA! looks on, my only complaint is that the large round glitters tend to want to lift up and take the base color with it. chipped nails is so not a good look! this is four coats of TIC topped with one coat of CMA! and finished with one coat of Seche Vite. do you guys prefer the pictures with my thumb included? i can't decide which i like better. i think my Ulta still had a few the last time i was there, but if not, there's always Ebay :) i confess, Ebay is like crack to me!